Sorority House at Indiana University, designed by KMD Interiors. Art by Larry Simon. Private Residence, designed by Kara O'Connor Interiors. Art by Allison Svoboda. Private Residence, designed by Divvy House. Art by Anne Smith Stephan. Private Residence, designed by JamesThomas Designs. Art by Dorothy Alig. Sourcing: We have the work of over 25 artists at the gallery, and even more at our disposal. Once we are briefed on a project's requirements, we start accessing that work and respond with multiple options. And since we are always out finding great new art, our selection is constantly being refreshed. Designers can browse our website 24/7, but we have found that a phone consultation or in-person meeting gets the best results. 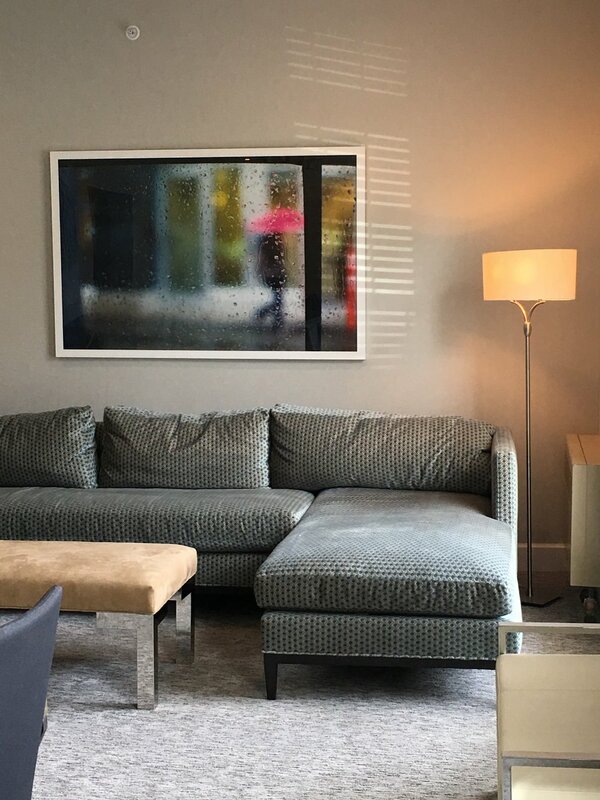 Services: We take collaboration further by allowing art out-on-approval, offering framing consultation, providing delivery and arranging for installation. This relieves designers of some time-intensive tasks and helps ensure client satisfaction. See our Services page for more information. Communication: We all know that timing is everything, and that certainly applies to finding the right piece of art. We encourage designers to stay in touch. If we know what they are looking for, in general or specific terms, we will keep our eyes open and follow up when we find a treasure. Email cynthiaburr@vividartgallery.net or call 224.505.5961 and fill us in. We also send designers a monthly email with new pieces and new artists, making it easy to stay up to date. Click here to connect with us. Check this spot frequently for a quick update on what's new in the gallery. These are our smaller pieces of work that fill compact spaces beautifully. These are all less than 400 square inches (20 x 20 inches). Come see our small works! Looking for a large piece of work to fill an empty wall? To help our clients find large pieces more easily, we've developed a page devoted to works of more than 2,000 square inches (approximately 45 x 45 inches). Come see our large works! These compilations can offer shortcuts to finding the right piece. Contact us to submit ideas for future collections. We host new exhibits every month, with openings on the First Friday. These are great opportunities for you and your clients to see new work and meet our artists. Click here to see details of the next First Friday.